Contemporary Controls' BASgatewayLX is part of the latest exciting addition to Tianjin, the Binhai Cultural Center. Tianjin is a thriving modern Chinese city that is a hub for innovative architectural design and equally impressive building automation to support energy management. The Binhai Cultural Centner is a large complex that includes a library, art gallery, museum and theater. The library is considered the main attraction, with space for 1.2 million books. Cascading bookshelves line the walls and a giant, luminous sphere in the center of the room solidifies the library's modern feel. 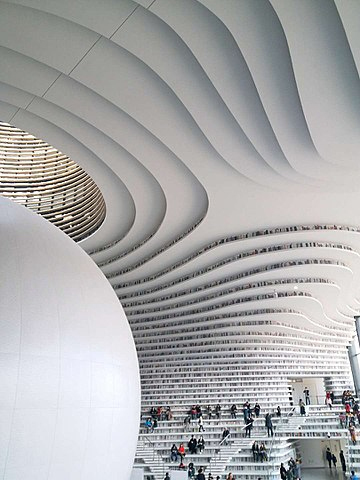 Because of the floor-to-ceiling bookshelves and the sphere in the center, the library has been nicknamed "The Eye of Binhai". A modern building requires modern energy management. The Binhai Cultural Center energy monitoring system includes an energy monitoring server, energy monitoring software, gateways and a variety of meters to measure electricity, water, heating and cooling to determine building energy consumption. The meters use the Modbus RTU communication protocol for air-conditioning, power and lighting measurements. Alarms, sent via workstation, email, SMS or PDA, are sent when identifying equipment failure and downtime. Monitors display real-time energy consumption, historical trends, data-logging, alarm status, equipment status, control and analysis. A report wizard generates energy reports quickly and easily that can be sent automatically via email. The real-time monitoring system requires the monitoring of electricity, water, and gas energy usage in all five buildings and the corridor. With a total construction area of 320,000 square meters, there were many types of water meters, electricity meters and energy meters, which were scattered across in different floors and areas. The disparate devices had to be effectively connected to ensure data accuracy, real-time performance and to ensure low maintenance costs. To further complicate matters, the water meters were from different manufacturers with different implementations of the Modbus protocol. When non-standardized Modbus devices of different manufacturers transmitting data on the same bus there can be data conflicts creating a major challenge to ensure data continuity, reliability, and integrity. Contemporary Controls had to modify its Modbus interface to be more resilient in handling these varying implementations. The energy platform monitors data from electricity, water and energy meters across the entire cultural center in real-time. The meters were all low-speed Modbus RTU serial devices, but because of the venue size and the disbursement of the meters, maintaining the Modbus RTU serial protocol and bus cabling throughout the center would not provide the required real-time performance while complicating cabling. To solve this performance and cabling challenge, Contemporary Controls used numerous BASgatewayLX gateways throughout the center. One port on each gateway attached to a Modbus RTU segment while the other port connected to a much higher speed Ethernet Modbus TCP network. The switched Ethernet network with its star topology greatly simplified cabling and the overall improvement in data speed improved system reliability. Modbus TCP uses the TCP/IP standard to pack Modbus RTU information into Modbus TCP frames. Modbus TCP devices can communicate via Ethernet over copper and fiber optic networks. Compared to Modbus RTU serial, Modbus TCP provides more addresses, can support multi-master operation, and greatly expand its data rate by operating over Ethernet. Contemporary Control's BASgatewayLX functions as a Modbus router when converting Modbus RTU to Modbus TCP. However, the product's main use is functioning as a gateway in converting Modbus RTU or Modbus TCP to BACnet/IP. As a Modbus to BACnet gateway, Contemporary Controls maintains a library of common device profiles with the more popular profiles shipped with the product. This reduces the heavy burden of mapping Modbus registers to BACnet points. Thanks to the BASgatewayLX Modbus to BACnet Gateway, the Binhai Cultural Center has an effective, accurate energy monitoring system that includes electricity, water and temperature meters across the entire complex. Converting the Modbus RTU to Modbus TCP Ethernet was the needed solution to provide the speed and reliability required by a sophisticated, modern building.